Last Wednesday, it rained the whole day in Seoul. 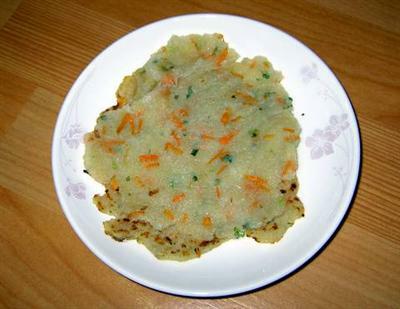 That inspired me to prepare “kamja jeon” (kamja – potato; jeon – grilled) or potato pancake for dinner. Koreans prefer to eat this during the rainy days of summer with beer or makkeoli (a traditional alcoholic beverage). My mother-in-law makes a mean potato pancake. And she taught me how to make it with this very simple recipe that anyone can do. Kamja jeon is a simple dish prepared with potatoes and onion. I learned to cook it from my mother-in-law last year, during a week’s vacation at their home. The onion is used to prevent the grated potato from turning brown. 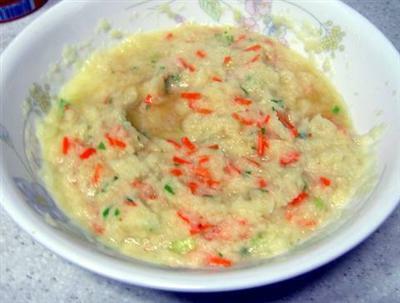 Other ingredients like green onions and carrots can be added to the mix. It should be partially drained to prevent from sticking to the pan. 1. Grate the onion in a bowl first. 2. Grate the potatoes and mix with the onion. 4. Partially drain the mixture. 5. Prepare a non-stick pan. Coat it slightly with oil. 6. Fry one ladle-full at a time. 1. Make sure that the pan is coated with oil. The batter could get so sticky. 2. If preferred, drain the grated potato a bit to prevent from sticking. 3. Add seafood like sliced squid or shrimp for more flavor. 4. Use sesame oil instead of plain cooking oil for added flavor. This is one of my favorite Korean foods. Glad to be back here again. Aba, bago yata hitsura ng bahay mo. Maganda, iba ang dating ngayon. I added you sa link ko ha. Hope Okey lang sa yo. Kahit naman tumanggi ka wala ka naman magagawa, kasi na add ko na at di ko na aalaisin. Okey ang dating ng page mo. impress ako. hindi ba yan nilalagyan ng flour or egg? or yan lang ung ingredients pag korean potato pancakes? Can you use korean yam instead of potato? I haven’t tried but that would yield a sweeter pancake.